The first part of the list ends with “Then the Flood swept over,” obviously a reference to Noah’s Flood. Some versions of this list also include a king named Kichuna of Larsa, and a Zinsuddu of Shuruppak. The names on the list of Berosus have been changed into names pronounceable to Greek readers; there is no letter “o” in the Sumerian or Akkadian languages. In the 1990s, David Fasold proposed a new interpretation of Berosus’ list. Fasold noticed that every number on the Berosus list is divisible by 3,600. This was not a deliberate rounding off but a translation of an earlier document that listed the reigns in a number of “saros-cycles” (Saros is a Chaldean astronomer’s term, representing the average amount of time between eclipses, or between 10 and 20 years), rather than years. Fasold proposed that the original author of the Sumerian King List listed the reigns of the kings in days, not years. He went on to propose that the pre-Flood world rotated more slowly than today’s world, so that consequently the antediluvian calendar had only ten months of thirty days each, or 300 days in a year. By dividing the reigns of the kings on the Berosus list by 300, we get reigns of 36 to 216 years per king. This is much more credible, and follows the chronology in Genesis 5 more closely. Divide the whole list by 300, and 432,000 years becomes a mere 1,440. This is less than the 1,656 years normally claimed for the period between Adam and the flood, but Fasold solves this by suggesting that Adam did not call himself “king” until he was at least 216 years old. Obviously Berosus was declaring the world’s first king a Chaldean from Babylon to make his own city look like both the oldest and the best place to live. By his time the chronicles had been so distorted that he would have had trouble giving Adam a nationality he had never heard of; even if the complete, true story had been available he probably would not have recognized it. We saw that the Sumerian account identified his home city as Eridu, a very old city on the Persian Gulf that had become deserted by 1000 B.C. It may be that there was no need for a king during the first 200 or so years because everyone gave Adam the respect due to an elder, and he could rule without any need for a formal government or trappings of authority, like the judges of the Old Testament. By the third century of his life, however, there were at least four generations of people around, and some of the young people did not believe Adam’s story that he was created, not born! Even Berosus seems to have doubted the story. Rumors may have been started by Cain himself, because even though he was in exile, it is likely he would have continued to claim his birthright from Adam because he was the firstborn. If this is the case, Adam would have declared himself “shepherd” (king) over all the people to make sure that Seth would be his heir. As it turned out, he only succeeded in ruling over the children of Seth. After the flood the earth’s rotation speeded up, and perhaps its orbit changed as well. Most of the world’s cultures used 360-day calendars for a long time to come. Egyptians, Mayans, Arabs, Chinese, Greeks, and many others all had either twelve 30-day months or ten 36-day months in their year. Immanuel Velikovsky thought this happened too often to write off as a mere rounding of 365 1/4 days into 360. Surely the ancient astronomers would have noticed if their calendar was 5 1/4 days off, for if they had let it go uncorrected, they would have found winter beginning in June 34 years later! In the 8th century B.C., the earth adjusted its rotation another time, changing from a 360-day year to a 365.24-day one. This occurred with less disaster to mankind, and may have involved the other planets, if Velikovsky’s theory is correct. Isaiah witnessed it, by noting the change in the shadow on Jerusalem’s main sundial (2 Kings 20:9-11). So did people from other cultures, and during that century they adjusted their calendars accordingly, usually by adding 5 days. The Greeks, for example, introduced a new calendar that counted from the year 776 B.C., the year of the first Olympic games. Late in the century the Romans followed suit, with a 12-month calendar that counted from the founding of Rome (753 B.C.). The Babylonian king Nabonassar (747-734) established a lunar calendar (354 days, with 7 leap months over a 19-year period to keep it accurate); it was adopted by the Jews during the Babylonian captivity, with all the month names unchanged, thus becoming the Jewish calendar of today. The Sumerians and Babylonians also believed that seven wise men (apkallu) were important. According to Berosus, the first was a creature named Oannes (also called Adapa, Musarus, or simply Uan), who came out of the Persian Gulf and taught the ways of civilization to the people he met. 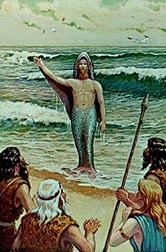 Berosus described Oannes as a demon that was half-man, half-fish, and the city of Eridu was founded where he revealed himself. Nowadays most scholars dismiss this story as just a myth; if they pay attention to it at all, they suggest that Oannes was an extra-terrestrial visitor. Mesopotamian legend identified Enki, the Sumerian water god, as the sender of Oannes; that’s why he had a “fishy” look about him. Consequently, Eridu became the holy city of Enki; the city’s main landmark was a temple to that god. Anyway, Oannes became an advisor to the first antediluvian king, Alulim/Aloros. He was followed by six other sages: Uandugga, Enmeduga, Enmegalanna, Enmebuluga, Anenlilda, and Utuabzu. Each of them in turn advised one of the early kings, and they were credited with introducing the Me (the original code of laws and morals), as well as arts, crafts and sciences. When the last sage, Utuabzu, finished teaching what he knew to Emenduranna, the seventh pre-flood king, he “ascended to heaven.” This should remind the readers of Enoch, who is also considered a teacher and who also did not die. I am far from the first to draw parallels between Genesis and the Sumerian King List. However, most scholars note that both Berosus and Genesis 5 listed ten patriarchs before the Flood; they give less attention to the fact that the original list had eight kings in the first section, not ten. Is there a list of eight patriarchs in the Bible? Yes, we saw one in Genesis 4: Adam, Cain, Enoch, Irad, Mehujael, Methushael, Lamech and Tubal-Cain. Therefore, I propose that the first section of the Sumerian King List is not the lineage of Seth, but the lineage of Cain. We will see later on that to the builders of the Tower of Babel, the real heroes of the past were the civilization builders who perished in the Flood, not those who obeyed the god who caused the Flood in the first place. The seven sages, however, could be the lineage of Seth; we certainly have a Mesopotamian representation of Enoch in the last one. I mention elsewhere that there was probably war between the Cainites and Sethites, but it did not have to be continuous. A parallel to that in modern history could be the rivalry between England, France and Germany; those countries did fight some very nasty wars, but during times of peace, trade and cultural exchanges between those three European powers were possible. Of course this is speculation on my part, but I am going to suggest that relations weren’t too bad at first. As long as Adam, Cain and Seth were alive, everybody knew they were related to one another, and all parties were probably on speaking terms. The Cainites and Sethites traded and exchanged ideas during this time, giving the impression (from a Cainite point of view) that the Sethite rulers were teachers or advisors to the kings of the children of Cain. This impression would have been even stronger if the children of Seth had some government besides a monarchy, calling their leaders “chiefs,” “presidents,” or some other title that suggested they had less than absolute power. 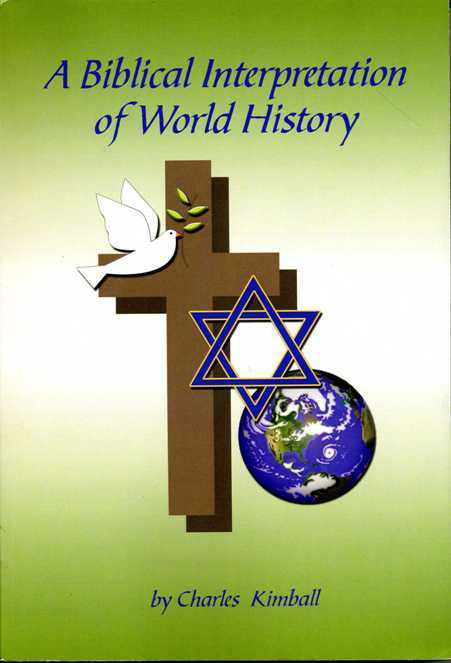 The antediluvian period of relative calm lasted until Enoch’s time on earth ended; in the previous section I mentioned the Jewish tradition that described Enoch as a peacemaker. Then all-out fighting began when Methuselah led the children of Seth, and either Lamech or Tubal-Cain led the children of Cain; because of that, the Sumerians did not preserve a tradition of Methuselah, his son or his grandson advising the kings of their day. There is also a distinct possibility that because the Biblical and Mesopotamian record of our origins have much in common, the oldest Mesopotamian cities might have names which come from the events or people in the first chapters of the Bible. More than one Bible scholar has suggested that Kish, the oldest city in central Iraq, was named after Cush, the oldest son of Ham (see Chapter 12). Before the Greeks came along, most forms of writing did not use vowels, which would make “Cush” and “Kish” both look like “Ksh.” David Rohl has proposed that both Uruk and Ur were named after Enoch, because their actual Sumerian names were Unuk and Unuki, respectively. Rohl goes on to see a connection between Bad-tibira and Tubal-Cain, because Bad-tibira means “City of the Metal Worker.” Finally, Eridu, which archaeologists and Sumerian historians believe is the oldest city of all, could have been named after Irad (according to Rohl) or Jared (according to Zecharia Sitchin). Officially the Seasons are Named Spring, Summer, Fall and Winter . . . In practice, however, they are observed quite differently. In Florida, the names I had for them were early summer, high summer, late summer and next summer. Or should I have said “tourist summer” for the last one? In Kentucky the locals act like the names of the seasons are baseball, vacation, football and basketball (LOL). Despite this, I’m not expecting the fans to get bored. Last Friday I mentioned that horse racing and indoor arena football are warming up. And baseball season officially starts this week, right? I filmed it last February 19, but I think I’ll wait until his feathers grow back before I film him some more. Since the year started Brin-Brin has been molting, and while his head, wings, back and tail still look the same, there’s just grey fuzz where his green chest feathers used to be. I have been told that long, heavy molts aren’t unusual for Amazons, but right now I get the nagging feeling that I’m looking at him in his underwear. No wonder he gets cold so easily at this time of year. Because the director, Fritz Lang, lived in a very secular European society, I don’t think he would have been interested in Babel’s spiritual meaning, namely that it was an act of rebellion against God. However, from a political aspect, I think he was right on, when he asserted that it would take a dictator to build such a monument, and that a universal, purely man-centered civilization would lead to tyranny. Think about it! Well, it was sunny enough last Wednesday that I went and bought some mulch for Leive’s garden. Since then, however, it has been rainy and gloomy. Especially today, when we got some thunderstorms in the morning, and experienced another of those temperature inversions that I never saw in Florida; it was 58 degrees when I went to work, but has bounced around 40 since I came home. With the flowers popping up in various places around town, it’s beginning to look like spring, but it sure doesn’t feel like it yet. As I chronicled on other occasions here, as the weekend arrives, the minds of many locals turn to sports. The horse racing season begins in a week, and tomorrow the local indoor arena football team, the Lexington Horsemen, have their first game of the season, against the Daytona Beach Thunderbirds. Regarding college basketball, the UK Wildcats were eliminated in the first round of the NCAA tournament, so last weekend, more attention was given to something in Rupp Arena called the “Sweet Sixteen Tournament”; I gather it was the statewide championship between high school basketball teams. The University of Louisville, however, won its second-round game yesterday against Tennessee, so they’re now one of the “Elite Eight” teams. The handful of Cardinals fans in town have something to crow about, anyway. Speaking of sports, when I got gas this morning, I noticed some Kentucky souvenirs in front of the cash register inside the store. Typical stuff, like key chains, mug warmers, and funny little statues — what I would expect to see in the gift shop at any Florida tourist attraction. Most of it had to do with horses and college basketball, reflecting local tastes. One of them, however, was a snow globe with a dolphin inside, next to the word “Kentucky.” While I would expect to see dolphins if I visited certain places in Florida, Kentucky doesn’t have a beach, and I never heard of any fresh-water dolphins in the state’s lakes and rivers, so what’s with that? Even the Newport Aquarium, which we visited last June, didn’t have any dolphins in it. I’ll bet if I turned the snow globe over, I’d find the words “Made in China” underneath, and whoever made it probably doesn’t know anything about either Florida or Kentucky. I think I told readers previously about the foster care and adoption classes that Leive and I are attending on Thursday nights. The person who was supposed to bring refreshments last night dropped out of the course, so Leive volunteered to make pancit. Once she started cooking, though, she couldn’t stop; by the time we went to class; we also had fried rice and hot chicken wings to bring in. Boy, did the class have a feast! Hopefully somebody else will contribute their share for the last two times we meet. Last March 12, I wrote about how a program to achieve energy independence from unfriendly oil-producing nations was more important than ever, because it would bring down the price of gas at the same time. That was a follow-up to Time For A New Manhattan Project, an essay on The Xenophile Historian where I said we needed to drill more oil, and increase development and implementation of other energy sources. Well, last week I read two encouraging stories on that. The first stated that internal combustion engines which can burn gasoline, ethanol and methanol are already available, increasing our flexibility when it comes to fuel sources. The other was even more heartening: oil has been discovered in North Dakota, under Bakken Play, a rock formation that also stretches into Montana and Saskatchewan. Lots of oil — an estimated 100 billion barrels. At $90 a barrel, that’s worth $9 trillion, and at current consumption rates, it could supply all US needs for the next twenty years. The oil poses some special challenges; it’s more than a mile underground, and drills will have to go in strange directions, including horizontally, to get at it. But as long as prices stay high, this job can turn a profit for the oil companies. The article says it will take at least five years to drill enough wells to make a difference at the gas pump. Even so, this discovery tells me that God is still blessing America, despite all our shortcomings, and He isn’t done with us yet. So let’s start drilling, tell the environmentalists something like “Earth first! 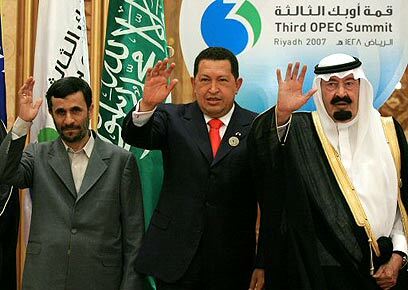 We’ll mine the other planets later,” and put OPEC out of business. Who really wants to buy gas from these guys? Enough already! Since I woke up yesterday, the media has been saying that last week marks five years since we invaded Iraq, and that we just passed the 4,000 mark for the number of Americans killed. I think even someone as obtuse as myself would get the message by now. But I’m going to ask the same question I asked when I wrote the two previous messages entitled “The War On Terror by Numbers” (see last August 25 and November 9): How many terrorists did our boys kill in return? Then I’d be in a better position to know if our painful sacrifice was worth it. However, I won’t be holding my breath. Knowing the behavior of NBC, CBS, ABC, CNN, NPR, and most other media networks these days, I’ll bet you heard nothing but crickets when they got to the other side’s casualty list. While we’re on the subject of issues related to politics, you may remember when I wrote recently about the entertainment I’m getting from this year’s Democratic campaign. The attacks between Hillary and Obama supporters are the best example of a circular firing squad I’ve ever seen. I also pointed out how drawn-out this pre-convention campaign is. Whereas in 2004 we went from the Iowa caucus to the Democratic convention in six months, this year it will take almost eight months. That’s why I said I wished I held stock in Orville Redenbacher; what a time to be in the popcorn business! However, today I got an awful thought concerning that. I’m probably going to run out of popcorn, long before this spectacle is over. 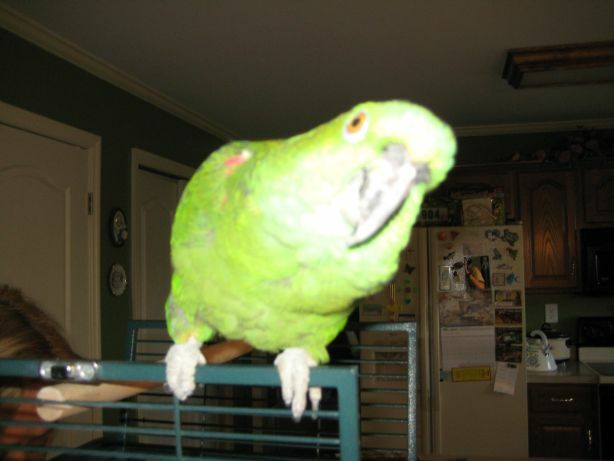 Will I end up fighting with the parrot over his dried pellets? I seldom cook from scratch, because when I do, strange things happen. Like the time I tried baking twelve almond cookies, and put them too close together on the tray; what came out of the oven was one big cookie, two feet long! As a result, during the six and a half months when I was in Lexington and Leive was in Orlando, I usually took a frozen meal to work on weekdays, and ate out on weekends. Toward the end of our separation I changed that routine a bit, by going to the salad bar at Kroger on Sundays, instead of a place like Subway. But rather than get sidetracked, yes, I know frozen meals and fast food isn’t a healthy diet. Leive pointed that out several times, and I did lose weight after she arrived here. I got confirmation of that over the weekend, when I saw a series of pictures on Strangecosmos.com, entitled “Fast Food Farce.” In case you didn’t know already, there’s an art involved with preparing advertisements; you want what you’re selling to look its best. What the Strangecosmos folks did what put together pairs of pictures. The first picture in each pair shows a well-known entree from McDonalds, Burger King, etc., as it appears on TV and in newspapers and magazines. The second shows the plain truth of what you get when you order it. For instance, note the fewer sesame seeds on the bun of the Whopper, in the first pictures. Ugh, was I really eating that junk? Keep up the good work, Leive!